Experience the very best affordable caravan and tourist parks in Australia with this full colour, updated guide to over 2300 sites. 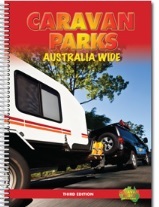 As the most comprehensive caravan and tourist park publication in Australia, Caravan Parks Australia Wide is a must have travelling companion. Whether you are a caravanner, motor homer or a traveller looking for cabin style accommodation, this guidebook contains all the information you need to find a place to stay. A numbered caravan symbol has been placed on the map at each town or location where a park can be found and each state has an index of parks at the beginning of the listing that can be used as a quick reference. Travellers can also use the informative symbols in the book to determine whether a park meets their needs. Coloured symbols are included on each listing to inform the reader about facilities such as powered sites, en-suite sites, tent sites, BBQ, pool, approximate cost, pets allowed, large sites, drive thru sites and dump points. Plan your trip on or off the road by checking the map for caravan symbols on your planned route, seeing at a glance what facilities are available at certain parks and using the GPS coordinates included in the book to find your desired location. Finding a park that meets your needs has never been easier.